Discuss - to be a classic, does something have to be both old and well-regarded, or is it enough simply to be old? I decided that for the purposes of choosing classic horror movies for my first five nights, simply old would suffice. This is timely, because I just had a haircut yesterday. Like the werewolf drinking a pina colada outside of Trader Vic's, my hair is... Perfect. Also, if there's one thing that movies like Pink Cadillac and Love Don't Cost a Thing have taught me, it's that movies that share titles with songs are awesome. 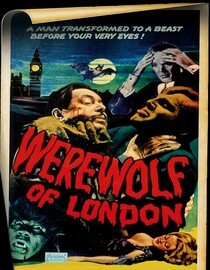 Werewolf films are hard to pull off. Vampires are easy. Take an attractive lead character, add fangs, boom. With werewolves, if you opt to make the monster look more on the human side, then you run the risk of it looking like a ridiculous fuzzy person. If you make it look more animal, then you lose the expressiveness of the person beneath. Add to that the fairly primitive make-up effects available when this movie was made, and it's impressive that it's as good as it is. To be honest, the story itself was just so-so. There's a side plot where the scientist's wife becomes reacquainted with an old love, and from the moment the guy comes onscreen, you know that he's only there to be wolf chow. When our hero takes to the streets for the first time as a wolf, he pauses first to put on a coat and hat. But there are some good little touches that still make it worth a watch. The early scenes in Tibet are very well shot, and there are some good comic relief characters. My favorite thing was the wolf make-up. This movie came out a few years before Lon Chaney's much better known The Wolfman, and the make-up in this isn't as good, but they did an interesting thing with it. Each time he transforms, he becomes a little more beastly than the time before, as though he's gradually becoming more and more of the wolf. Nowhere near my favorite werewolf movie (that honor currently goes to Dog Soldiers), but fun if you're looking for a classic Universal Monsters picture and have Netflix streaming. I give it three silver bullets out of five. it seems that botany is a very hazard-filled profession. who knew? Right? We need to warn kids thinking about this field that there is a better than average chance that they will be werewolfed. Danny, while I haven't seen Dog Soldiers, I'd have to say the best werewolf movie to date remains "American Werewolf in London". I'm sure you've probably seen it, but on the off chance you haven't, please make a note to watch it November 1. Also, even though I haven't seen "Bad Company" with Anthony Hopkins and Chris Rock (http://www.imdb.com/title/tt0280486/), I have to assume that it was criminally overlooked by the academy. Because according to your logic it should be about the best movie ever. Evidence listed below. I should have turned on the tag when I was talking about Pink Cadillac and Love Don't Cost a Thing. Though now I may have to see Bad Company just to see if that holds true. to your question does old = classic; in a word, no. old dreck is not classic, but can sometimes find a home in a subcategory like camp classic or cult classic, if it's just too goofy for words, or has developed a rabid fan following for reasons that are hard to put your finger on. consider the rocky horror picture show. it's campy and has developed a bent cult following, and while not horror, i find it horrifying. dog soldiers is okay; i thought their headpieces looked cheap and fake. to say it's the best werewolf movie, and a lot of folks feel the way you do, is like saying it was the june employee of the month at burger king. the competition is dubious, mainly because the effect is, apparently, so hard to pull of realistically. american werewolf in london does it pretty well, though. production note: for some of the shots of that werework walking on all fours they dressed a man in a costume and pushed him around hanging out the front of a wheelbarrow. i kind of love that image. but, the dog soldiers director did go on to make the excellent claustrophobic cannibal-creatures-in-the-cave feature, the descent, so he's got the skills, maybe he just didn't have the budget, experience, production time on dog soldiers.